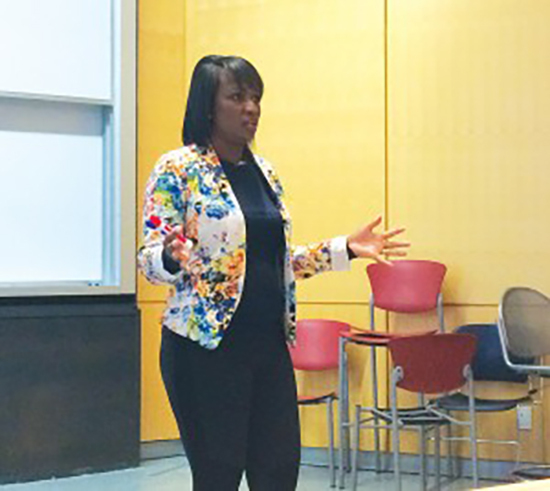 Whitby MP Celina Caesar-Chavannes has been the talk of Durham Region politics since Justin Trudeau paid a visit to her campaign during last fall’s federal election. Her popularity and the fact the pair clicked made it no surprise when Trudeau reached out to Caesar-Chavannes to offer her the position of Parliamentary Secretary on his new team in Ottawa come December. While in the new position, she continues to represent the riding of Whitby in the House of Commons with pride. Whitby has a long history of being a Conservative riding. The late Minister of Finance Jim Flaherty sat in office as MP from January of 2006 until his death in April of 2014. In the resulting byelection, Caesar-Chavannes came in second to Conservative Pat Perkins. But in last fall’s general election, she won the Whitby seat for Trudeau’s Liberals, this time topping Perkins. Caesar-Chavannes knew that in order to resonate with the Conservative members of the community, she’d have to do things a little differently. “Having respectful dialogue is important to me,” she says. It is an ideal Caesar-Chavannes has stayed true to as she has taken on more political responsibility in the past months. Believe it or not, the political world is a new scene for her. “About two years ago at this time, April, I was just kind of figuring out how to become a candidate,” she says. Caesar-Chavannes partly credits the political interest of her two daughters for her involvement. “My 16-year-old, Desiray, in particular, she does model Parliament and mock UN (United Nations). Growing up, she wanted to be a neuroscientist. She graduated from the University of Toronto with a Bachelor of Science degree in biology. After which, she earned an MBA in health-care management as well as an executive MBA. She focused on the firm, ReSolve Research Solutions, until December, 2013. Having no experience in the world of politics seems like it could be a major setback, but Caeser-Chavannes wasn’t going to back down after the challenge of her first loss. Caesar-Chavannes says the balancing of MP, Parliamentary Secretary and being a mom is something she’s asked about a lot “and so I say what I said to my daughter a couple years ago. She said ‘mommy, how do you balance everything?’ and I said ‘Desiray, when things are unbalanced how much percentage do you give each one?’ and she said ‘50/50’. Caesar-Chavannes might be too fresh on the scene to be thinking about her legacy, but she admires the style of one of her predecessors. “I could tell that people were really loyal to Jim Flaherty. I would want to be able to work hard enough that people be loyal to me. Previous articleWould Durham College benefit from football?